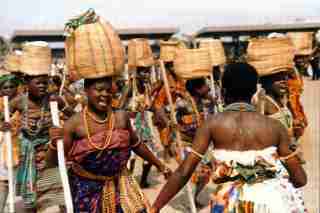 Hogbetsotso Festival is a festival of the people of Anlo in the Volta Region of Ghana. The theme behind this festival is to mark their journey from their former home in Togo, to their present settlement in Ghana. The festival is a great time for the people, as this marks a great time in their history and is a time for settling disputes and getting to know each other. History has it that before coming to their present settlement. The Anlo lived under a cruel and wicked ruler, King Agorkoli of Notsie, somewhere south of present day Sudan. The Anlo people devised a way to escape from the town. They were led by a brave warrior known as the Red Hunter. The town they were was fenced with a mud wall, so the Anlo women were told to pour water on one side of the wall anytime they had to dispose off any water. This made the spot soft, and the people were able to break the wall and escape. To avoid being caught, they "walked backwards" so as to confuse their pursuers and even legend has it that “The Red Hunter” turned himself into a rat and walk over all their footprints to make them look old. When they got to their present home, they created the festival Hogbetstso (Festival of Exodus) to mark this event. The festival has a host of other celebrations associated with it. There is a period of peace making. During this period, all outstanding disputes must be resolved. The aim is to bring the people together to live in harmony with each other. There is also a general cleaning in the town. The whole town is swept, gutters cleaned, bushes are cleared and everywhere is kept clean. The cleaning which starts at the estuary of the Volta River, goes on until it reaches the Mono River in Benin. This cleaning exercise is all inclusive and everyone in the town is supposed to take part. The people of Anlo believe that if they keep their surroundings clean, and they live in harmony with each other, no evil can befall. They believe that their ancestors lived in harmony with each other all throughout their journey and that is what helped them to arrive at their destination. Therefore if they also want to be able to live in harmony, they must love one another. The cleaning continues for days until everywhere is well kept. The highlight of the Hogbetsotso Festival celebration is a grand durbar of the chiefs and people of the town. There is drumming and dancing and merry making. The dancing is the most intriguing part, with the very popular “BORBORBOR” dance which is very intense and fun filled.